Okay, so each week for our awesome stuff post about crowdfunding projects, we look at a variety of interesting projects for weird, funky, innovative and interesting products that are being offered on platforms like Kickstarter and Indiegogo. This week is going to be a bit different. 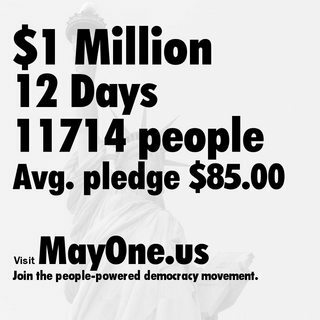 We're just going to point people to a single project: Larry Lessig's MAYDAY.US. And, yes, we already wrote about this at the beginning of May when the first phase launched, and again when it hit the $1 million goal -- and then secured the second million in matching funds. However, the project has now moved into phase two, where the goal is to raise (and match) $5 million, instead of just $1 million. Already it's around half a million dollars, so there's a long way to go, but it's a good start. And, once again, the goal here is to raise this total of $12 million ($1 million + $1 million match in May, and then $5 million + $5 million match in June) as a test for a much larger effort. I've seen too many overly cynical folks say "$12 million isn't enough to change politics." And you're right. But that's not the goal. This is $12 million to be used in specific races as a proof of concept for a much larger moonshot. But to make that happen, this campaign needs to get to $5 million by the end of June. If that happens, it will truly fit into the category of "awesome stuff."